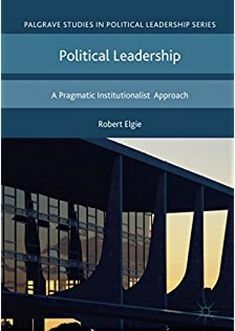 This book provides a philosophically informed, institutionalist account of political leadership. It is rooted in a Peircean version of the American pragmatist philosophical tradition and privileges the study of institutions as a cause of leadership outcomes. The study includes identifying the psychological effects of presidentialism and parliamentarism on leader behavior, a study of the impact of institutions on electoral accountability for economic performance, studies of president/cabinet conflict in Europe, presidential control over cabinet composition in France, and constitutional choice in France and Romania. It adopts a multi-method approach, including a lab experiment, large-n statistical tests, and Qualitative Comparative Analysis, as well as two in-depth process-tracing case studies. The aim is to show that an institutional account has the potential to generate well-settled beliefs about the causes of leadership outcomes. In this post, we outline the work in one chapter. In this chapter, we re-examine Hellwig and Samuels’ (2007) article on economic voting and the clarity of institutional responsibility. Like Hellwig and Samuels, we are interested in the relative effect of parliamentary and semi-presidential institutions on electoral accountablility for economic performance. We are also interested in exploring the effect of variation in presidential power on economic voting in this context. In short, we are interested in whether institutions condition the extent to which presidents and prime ministers are rewarded/blamed for good/bad economic performance. To address this issue, we update Hellwig and Samuels dataset, noting certain revisions to the way in which they record the vote at elections with the aim of maximising the reliability of the values in the dataset. We then use exactly the same estimation technique as Hellwig and Samuels. There is insufficient room here to go through the results in depth. (Which is just an ill-disguised invitation to buy the book). There is also no space to describe how the variables have been operationalised. Again, all that material is in the book. Here, we just wish to provide a flavour of the results. We find support for Hellwig and Samuels’ basic finding that electoral accountability for economic performance is greater under high-clarity elections, i.e. where there is a single-party government, than low-clarity elections where there is not. More interestingly, our results also show support for Hellwig and Samuels’ finding that the electoral accountability of the president’s party for economic performance is significantly greater during periods of unified government relative to cohabitation. Figure 1 reports the basic results of our models in the same way that Hellwig and Samuels present them in their paper. While we are concerned with re-testing Hellwig and Samuels’ thesis, we are really interested in exploring how presidential power shapes the clarity of responsibility for economic voting. Hellwig and Samuels do not follow up on this issue in their article. So, we are trying to build on their work by integrating presidential power into their analysis. We find that presidential power does help us to understand how institutions shape electoral accountability for economic performance. For example, when we include presidential power in the model we find that there is significantly greater economic voting at presidential elections with strong presidents. Again, this makes sense. When there is a strong president, the clarity of responsibility should be higher. Voters know better whom to reward or blame. By contrast, when there is a weak, non-executive presidency, we would not necessarily expect the incumbent president or their party to be held accountable for economic performance. (See Figure 3 relative to Figure 2). In addition, we also find that electoral accountability for economic performance is conditional upon presidential power during cohabitation. In these periods, there is significantly greater economic voting during periods of unified government when there is a strong president. (See Figure 4 relative to Figure 1). In other words, the combination of unified government and presidential power shapes economic voting at elections under semi-presidentialism. These are only a flavour of the results in the chapter. Spoiler alert, not all results are as expected. Most, though, are. We would like to thank Hellwig and Samuels for supplying their dataset for replication purposes. Obviously, all results presented here and in the book are the author’s responsibility alone. Hellwig, Timothy, and David Samuels (2007), ‘Electoral Accountability and the Variety of Democratic Regimes’, British Journal of Political Science, 38: 65-90. This entry was posted in New publications, Presidentialism, Presidentialism and parliamentarism, Semi-presidentialism and tagged Political Leadership, presidentialism, semi-presidentialism on February 2, 2018 by Robert Elgie. 1 January marked the start of Bulgaria’s first presidency of the Council of the EU. This position amplifies international attention towards the country’s process of democratization and demands further investigation of the political practice in institutional power sharing. The following text is an overview of some of the key issues that Bugaria’s EU presidency will highlight in the next six months: (1) inter-institutional conflict over anti-corruption laws; (2) the dynamics between the parties in the governing coalition; (3) PM Boyko Borisov’s political strength. Bulgaria is a premier-presidential semi-presidential republic. This means that control over the government is assigned to the parliament, while the directly elected president shares some executive powers with the PM. The president can also veto legislation. President Rumen Radev used this veto right on 2 January 2018 against new anti-corruption law supported by the parliamentary majority. This is a controversial piece of legislation. According to it, the chair and all the members of a special anti-graft committee meant to investigate high public officials would be appointed by the parliament with a simple majority. The president claims this provides the framework for the parliamentary majority to manipulate the institution’s authorized use of special intelligence means – such as wiretapping – to target political adversaries. PM Borisov’s main coalition party Citizens for European Development of Bulgaria (GERB) and partner United Patriots support the law, claiming that it answers to the demands of the European Commission for decisive action against corruption. The Bulgarian constitutional semi-presidential framework favours the implementation of decisions made by the parliamentary majority and limits the powers of the president once the government is formed without his own party. Consequently, we can expect that the president’s veto will be ruled out through a new vote in parliament and that the government backed legislation could soon enter into force. The controversy surrounding this piece of legislation shows the potential for institutional disagreement when PM and president come from a different political support base. Such policy related conflict is not uncommon in situations of cohabitation and we could easily anticipate its outcome. The constitutional semi-presidential framework favours the implementation of decisions made by the parliamentary majority and renders the president weak once the government is formed without his own party. Consequently, we can expect that the president’s veto will be ruled out through a new vote in parliament and that the government backed legislation could soon enter into force. But this particular conflict is more than ”business as usual’ cohabitation skirmishes. The debate on the framing of anti-corruption legislation law is telling about the state of elite commitment to consolidate the rule of law in Bulgaria and warns about the democratic progress of the country. Radev was elected president with the support of the main opposition Bulgarian Socialist Party (BSP). BSP had also proposed their version of an anti-corruption investigative agency whose head would be named precisely by the president. The competing propositions show a lingering understanding that in a young democracy such as Bulgaria, institutions could be created or shaped having in mind the immediate political benefits brought by a temporary distribution of power. While more advanced in its anti-corruption fight, a similar inter-institutional clash takes place in neighbouring Romania. In the Romanian case, the parliamentary majority is currently working on legislative reforms that would eliminate the president from the procedure to appoint the general prosecutor, the chief prosecutor of the National Anti-corruption Agency (and their deputies) and the chief prosecutor of the Organised Crime and Terrorism Investigation Agency. GERB formed the government with the political alliance United Patriots (UP). UP consist of three parties – Ataka, led by Volen Siderov, the National Front for the Salvation of Bulgaria, led by deputy PM for Economic and Demographic Policy Valeri Simeonov, and the Bulgarian National Movement, led by Deputy Prime Minister and Minister of Defence, Krassimir Karakachanov. The extremist and racist public positions of the UP leaders regarding immigrants and the Roma communities have constantly raised international concerns. The UP ministers that assumed ministerial portfolios and their views are now expected to ‘shock Brussels’. [i] Nevertheless, while their rhetoric stems out, their views on limiting immigration are embraced by all parliamentary parties. Also, PM Borisov has so far proved to be in control of his coalition partners, satisfactorily addressing their demands without losing his status as Brussels’ ‘golden boy‘. As a result, the UP parties have moderated their tone in 2017 and in view of the EU presidency. Opinions may not change on the way from Sofia to Brussels, but their international public discourse could prove to be more restrained than it has previously been on the home front. Moreover, the prospect of Bulgarian racism and xenophobia at the highest level of European decision making is but a teaser of what could follow once Austria takes over the presidency on 1 July. While the main political presence in both Sofia and Brussels is now secured by GERB ministers, the incoming Austrian government numbers five ministers from the far right Freedom Party (FPO), including the Minister of Interior and an FPO supported Foreign Minister. PM Borisov is highly concerned with internal stability during this period, satisfying requests from different segments of society to avoid any protests. He asked for restraint and ‘more patriotism’ from the socialist led opposition not to initiate a planned vote of no confidence for 17 January, pointing at them as inopportune trouble makers. He secured a truce with the opposition party Movement of Rights and Freedoms (DPS) and its leader Ahmed Dogan. [ii] Internationally, Borisov has set up the Bulgarian presidency as a ‘Balkan presidency’, proposing an ambitious agenda for a clearer European perspective for the Western Balkans. This choice of priority is a manifesto of a pro-European stance which Western Europe expects and favours. This comes in contrast with the pro-Russian image that president Radev and the BSP have been painted by Western media despite no practical proof of defiance against NATO or EU policies. In its 12th year of EU membership, the Bulgarian state continues to grapple with a multitude of ‘sins’ familiar to observers of the democratization process of post-communist states, from unaddressed high-level corruption to power personalization and legislative instability. The EU presidency in itself may not structurally affect political activities, but it serves to highlight elite priorities and the political strategies on the ground. So far, this translates into a focus on the PM and his long term self-empowering ambitions of institutional reform. [i] Out of similar concerns, another interesting point on the EU calendar is the meeting of the EU Environmental Council to be led by UP supported Environment Minister Neno Dimov, known for a 2015 statement that global warming is a manipulation. [ii] The power of DPS is far greater than its legislative size as it is also the party of Bulgarian oligarch and media mogul Delyan Peevski. [iii] GERB favours an electoral reform towards a majority run-off system from which it (and BSP) could also benefit in the medium and long run. President Radev and smaller parties support a mixed electoral system. This entry was posted in Europe, Semi-presidentialism and tagged anti-corruption, Bulgaria, European Union, far-right, semi-presidentialism on January 8, 2018 by Veronica Anghel.